The first iSize car seat that grows with the child: from 100 to 150 cm with 11 height positions. iQuartz has passed the strict safety tests of European Standard ECE R129/02 iSize. Maximum safety with an unique and exclusive design. The new iQuartz car safety seat is the latest addition to the complete CRS range from Jané. iQuartz is a restraint system that uses Isofix fasteners, designed for a child height range from 100 to 150cm, approximately 3 to 12 years. Technologically advanced, iQuartz is fitted with Proportional Height Adjustment, an integral adjustment system that lets you regulate the height by up to 11 positions. 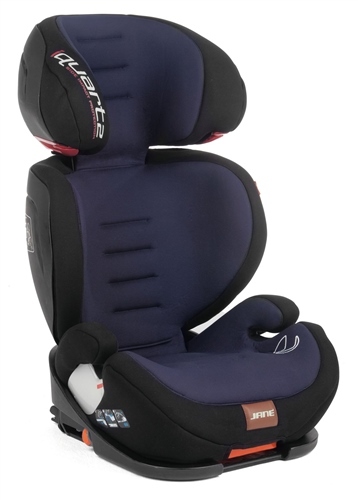 When the height of the seat is extended it is not just the headrest that moves, the backrest also moves to the corresponding height thereby guaranteeing that the child has maximum protection throughout all the stages of growth. Install the car seat with the Isofix anchors for extra safety and stability.The child is held secure with the vehicle 3-point seat belt using the belt guides. iQUARTZ is a safety seat to be used together with the 3-point seat belt in the vehicle. It is also fitted with anchors on the base that can be secured to the ISOfix of your car to give more stability. The iQUARTZ car safety seat can be installed with or without the ISOfix anchors, although it is advisable to use it with the ISOfix anchors as this gives greater convenience and safety. If you use it with the ISOfix anchors, iQUARTZ is compatible in cars with iSize certified seats. This information is available in your vehicle manual. If you use it without the ISOFIX anchors, iQUARTZ is compatible with most vehicle seats. When the vehicle manufacturer states that the vehicle seats are suitable for use with “Universal” type safety seats, you can be sure of complete compatibility. New i-Size regulations: for a child height range from 100 to 150 cm, approximately 3-12 years. Adaptable: iQuartz is a multi-group iSize safety seat designed to adapt to the child at each stage of growth, thanks to its unique integral proportional height adjustment system (11 positions) that lets you extend the backrest and headrest automatically. Maximum side protection, the wraparound shape of the frame increases the absorption of any possible impact and provides greater shock absorbing properties. Width of seat is 45 cm. 3 reclining positions so the baby can rest comfortably. The headrest includes large sized ear protectors, which means that in the event of a side impact, the child’s head remains in the safe area of the seat, thereby guaranteeing maximum protection. Ventilation: Ergonomic design with ventilation vents making it more breathable for the baby. Breathable Soft Touch padding. Removable and washable upholstery. It is used together with the vehicle 3-point seat belt. It is also fitted with ISOFIX anchors on the base for greater stability and safety. Jané iQuartz iSize has passed the strict safety tests of European Standard ECE R129/02. Side impact tested, impact approved.